Their passionate affair ended in heartbreak when he left without warning. When he returns unexpectedly, can their heat melt away the hurt of the past? Kashif Shadid has always craved adventure. With one last chance to win the Iditarod dogsled race before assuming his role as sheikh, he’s returned to the Alaskan wilderness to train at a legendary sled-dog farm. But returning means coming face-to-face with Kristy Cohen, the woman who captured his attention years ago. He’s thrilled once again by her icy beauty, but her farm is facing financial ruin. Kashif’s eager to take control; however, getting her to agree with his plans may be a challenge. Kristy Cohen works hard to keep her sled-dog farm afloat while raising her young daughter. Faced with declining revenues and a changing climate, Kristy’s struggling, but she’s not willing to turn her back on her business model. When Kashif Shadid shows up out of the blue pushing her to make changes, Kristy’s response is as cold as the Alaskan snow. She fell for tall, handsome Kashif once before. After four years without a word from him, she won’t be making that mistake again. This time, Kristy’s guarding more than just her heart. With her farm and her daughter to consider, can she ever risk taking a chance on Kashif again? I have not listened to the first two volumes of this series. This book stands alone. I enjoyed this romance novel. The story is good. The characters are interesting. The narration is excellent. I would listen to more books by Joseph Tobey. I requested this review copy audiobook and have voluntarily written this review. I got this story via audiobook boom and this is my voluntary review. This was another Sheik story with a slight twist. A stint in the Alaska outback creates a new family and completes the story of the brothers. The baby's voice was outstanding and she was a hoot. The whole story was entertaining and done well. I enjoyed it. A throughly enjoyable story. I liked the characters. The love story endearing and the conflict understandable. Kristy had a stubborn streak a mile wide but could eventually see reason and take action when needed. I liked how the story brought out and portrayed the very real effects of global warming. Joseph Tobey did a fabulous job narrating. I recieved a Audible copy of this story in exchange for a honest review. Leslie North created the atmosphere for a reader to enjoy in front of a fire with a warm blanket, hot drink and a snuggle with the one you love. The Sheikh's Christmas Baby is sentimental gold. From the breathtaking winter wonderland location of Alaska to the descriptive story of shattered love and of course those adorable dogs. It would be inhumane not to have fallen a little in love with Kashif and Kristy. Any time a story leaves you with a warm feeling inside and a smile on your face, it's a winner. 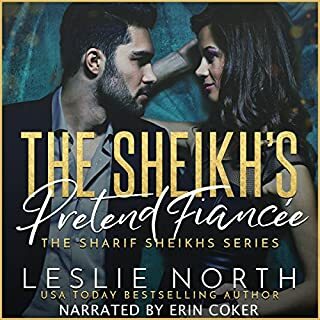 This is the third book in the Shadid Sheikhs Series. I love this Series! 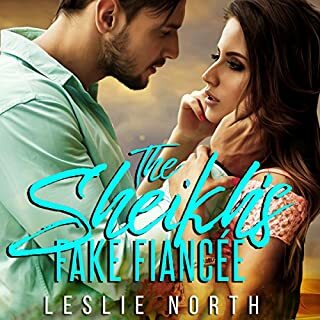 This is a beautiful second chance to love and a Sheikh Christmas story. I loved Kristy, Kash and the little Arella. I loved the Epilogue! The narration was well done, as always with Joseph Tobey. I received this free review copy audiobook at my request and I have voluntarily left this review. 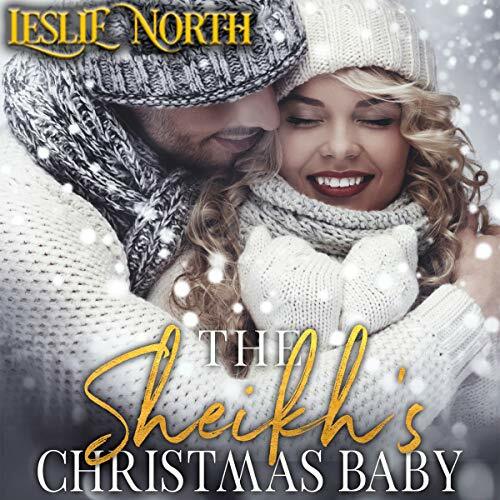 The Sheikh's Christmas Baby by Leslie North is a sweet second chance at love. I so enjoy this genre of romance, and the author is so great at it. This book is both a standalone listen and conclusion to the Shadid Sheikhs. Joseph Tobey performed this book with a wonderful voice that sounded like a Sheikh. I thought this story was original and enjoyed the humor of Kristy's daughter calling herself a Princess and how she interacted with the "Puppies" and goat. The imagery in this book is outstanding. I requested this review copy audiobook and have voluntarily written this review. I will definitely listen to more books by this author and narrator. Kasif may be the oldest son, but he dies not desire to lead his country. He goes on adventures to feed his adventurous soul when he is lead to Alaska, dog sleds, the Iditarod and Kristy. Kristy is inexperienced, but falls in love as does Kasif..but suddenly he is gone and she is told he makes conquests leaves and that’s it. A consequence of their affair is a little girl...intercepted communication and hurt feelings separate them until Kasif comes back once more. There’s, a battle between the two..she is afraid she will be left again and he wants another chance. A romance in an unlikely place with people from Two very different worlds. Narrator was wonderful, great accent and wonderful emotion, and timing. Who would think after 4 years a Sheikh would come back to rekindle his love? Four years earlier, Kashif came to Alaska to experience the Iditarod dog sled race. He wasn't looking for love, but it found him with Kristy. He had to leave unexpectedly, and due to some meddling, the two did not speak again. Now 4 years later, Kashif shows up again, and things have changed. Will he be able to win Kristy over? North has a way of writing that is easy to listen to and fall into their story. I enjoyed Kashif and Kristy. Kashif is not only smart and handsome, but the man is determined. Kristy is independent to a fault and not so easy to jump back in. Their story is fun and romantic! Joseph Tobey narrates this with his warm voice. His accent for Kashif flows like butter, making it hard for Kristy to resist. He easily switches between male and female narration making his performance a wonderful listen.